Season 1: Dexter and the department hunt a fellow serial killer nicknamed the Ice Truck Killer, whom Dexter discovers to his horror knows his secret identity, and whose grisly work triggers Dexter's suppressed memories of his childhood; Dexter's sister Debra transfers into the Homicide Department; his girlfriend Rita deals with the surprise return of her paroled ex-husband, who doesn't want Dexter around his kids. Season 2: Dexter attempts to sabotage his own department's investigation into his grisly serial killings, and carries on an affair with Lila, an obsessed pyromaniac; traumatized Debra dates the FBI agent assigned to his case; noticing some of his unusual behaviors, Rita urges Dexter to join a treatment program for addicts. Season 3: Dexter befriends an assistant District Attorney whose brother he was forced to kill, and who becomes increasingly and disturbingly helpful in Dexter's secret pastime; Debra gets a new partner in Joey Quinn, who helps her and the department investigate a fiendish new serial killer, "The Skinner." Season 4: Dexter has become a family man with wife Rita and a new baby boy, and must work harder than ever to conceal his murderous urges; Dexter discovers a potential mentor when he learns the blandly domestic identity of the Trinity Killer, the latest serial murderer plaguing Miami, but his attempts to curb Trinity's macabre cycles of slaughter have shocking, tragic results. Season 5: Dexter mourns his devastating loss while barely escaping detection by his sister, her partner-turned-boyfriend Quinn, and disgraced former cop Liddy (Peter Weller); he also reluctantly provides his advice and guidance to Lumen (Julia Stiles), a near-victim of a serial killer and his abusive accomplices who sets out to get lethal revenge on those who kidnapped her. Season 6: Dexter considers the nature of faith while stalking the Doomsday Killer (Colin Hanks), a vicious, deluded, religious fanatic who displays his victims in grisly, Biblical-themed tableaux; Deb gets promoted to lieutenant and reconsiders her relationship with Dexter; Quinn goes on a season-long bender that threatens his partnership with Batista; Masuka hires an intern who is in awe of Dexter. 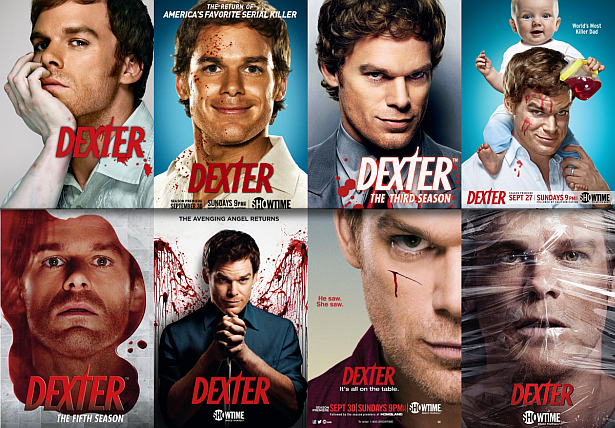 Season 7: Dexter is forced to come clean to Deb about his murdering ways and finally finds true love in the arms of a beautiful fellow serial killer; Deb learns the hard way how difficult it is to keep Dexter's dark side a secret; Batista buys a beachside restaurant and retires from the force; Quinn falls in love with a Ukrainian stripper and runs afoul of her mob bosses; LaGuerta gets closer to pinning the Bay Harbor Butcher killings on Dexter. Season 8: Dexter learns more about his dark origins from Dr. Evelyn Vogel, an old family friend, while helping her track down the Brain Surgeon, a new serial killer who is terrorizing Miami; Dexter is reunited with Hannah and they plan a life together; Deb suffers the consequences of loving her brother despite everything she knows about him; Batista is made Lieutenant and calls off his retirement; Masuka finds out he has a daughter.